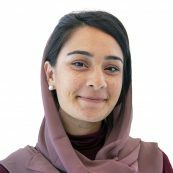 Amirah Ahmad is a Logistics Assistant at PYXERA Global where she provides program management and logistical support for Global Pro Bono projects. Prior to joining PYXERA Global, Amirah interned for the International Rescue Committee’s food security and agriculture division, where she focused on economic and social empowerment for refugees in Charlottesville. She has previously interned in China, Indonesia, and Ghana in the fields of writing and education. Amirah holds a BA in Economics and Global Development Studies from the University of Virginia.